In a bank, there are myriads of traditional operations like deposit operations, lending or credit operations, foreign payment operations, and so on. Each of these operations proves time-consuming when they comprise of multiple steps involving manual labor from skilled employees. Majority of banks across the world have acknowledged, it is vital to reduce the time that goes into these operational processes for better productivity and customer satisfaction. According to Hartley Withers, a renowned financial journalist, "Good Banking is produced not by good laws, but by good bankers." This quote is justified because indeed good bankers know how to adapt the technological advances to stay relevant in a competitive environment. They emphasize on offering world-class customer service while streamlining the banking operations with the help of new technology. Many banks are now using digital solutions to ensure less time consumption for operational processes. Accurascan, a document scanning app is one such digital solution that promises digitization of documents at a fast pace with the help of Optical Character Recognition (OCR) technology and device camera. OCR technology is not new. It has been in use in educational institutions for quick evaluation of answer sheets. 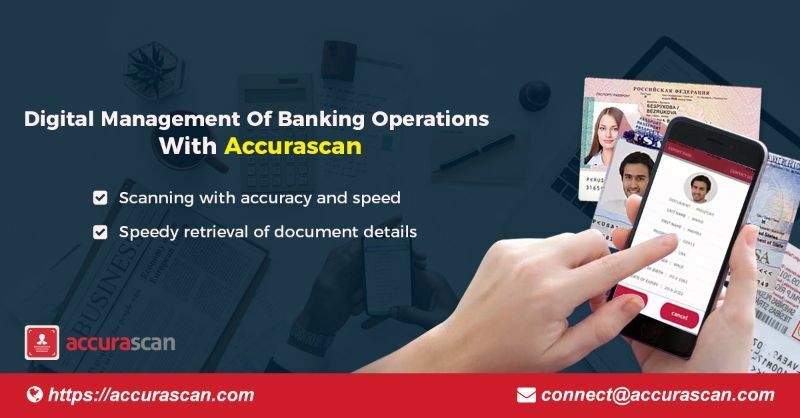 Accurascan, innovated by Accura Technolabs, a Singapore based firm, has striking features that make it apt for use in banks and other financial institutions around the world. Accurascan as a document scanning app is accurate with its high-precision recognition of printed text and converting them into digital documents that are easy to be processed by a computer. Thus, it enables its user to perform indexing or editing of such digitized documents in an effortless manner. The average time to recognize printed text by Accurascan takes less than 500 milliseconds which enables a person to scan loads of documents such as ID cards, passports, and visasincredibly fast. Fast access to information proves crucial in banks and other financial institutions just like any business organization. Accurascan does not facilitate the same, but AccuraGo-a ready-to-use SaaS based scanning solution offered by Accura Technolabs allows a user to store the scanned data on a cloud server with end-to-end encryption. This helps in speedy retrieval of document details. Thus, the Accurascan app not only eliminates the need to do manual typing to feed document details into a computer software but also eliminates the risk of human errors that happen while typing. Thus, it proves advantageous to banks in multiple ways starting from fast digitization and retrieval of documents to eliminating human errors in data input. All these advantages make the app apt to get incorporated into banks as a digital solution for management of banking operations. The futuristic app is available with a Web SDK/API that allows easy integration of the app into any other existing app for mobile or web platforms. Available on both Google play store and App store, it is possible to download and install the demo version of Accurascan on mobile devices without spending a single penny.